One of the plants we use for a ground cover on a steep hillside section of our garden is called the Rock Rose Ice Plant (Aptenia cordifolia). It is a succulent that has plump green leaves, and dainty red flowers that attract honeybees. I've always liked ice plant but it's never something I've wanted to use... maybe because I've never needed groung cover. Nice shot. Those thick leaves and the red flowers are a perfect combination. 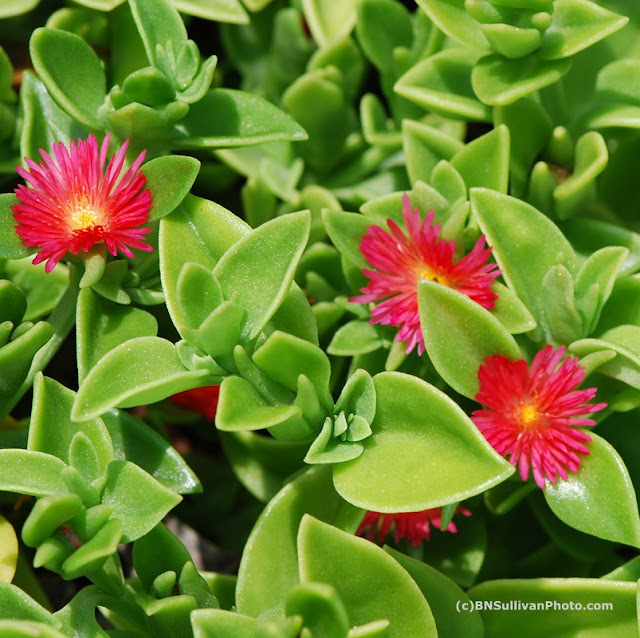 Wonder why they call it Ice plant? @ 2Sweet - Thanks. I never had this plant where I lived in earlier years -- also for the same reason you state. @ Becky - You know, I'm not really certain where the name comes from. I asked the woman at the garden shop the same question one time. She said she thinks it's because the leaves appear to glisten in the sunlight. They do that because they are covered with eensy-weensy hairs -- like fuzz -- and moisture from the air sticks to the fuzz giving the leaves a sort of wet look. If someone else knows a different reason for the common name, please tell us.